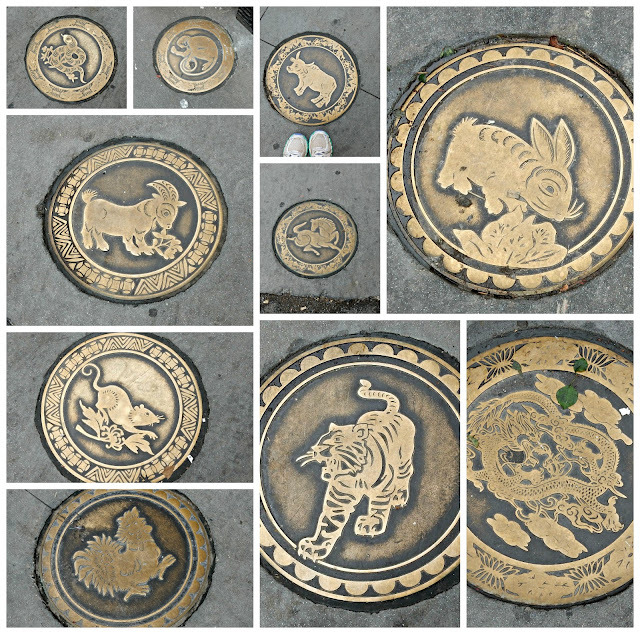 I was walking around Chinatown in Philadelphia and saw that they had the coolest manhole covers. They were from the Chinese Zodiac, and were brass. That is so cool. I had no idea. Roanoke's covers are pretty boring but I have noted how old and worn they are. I'm guessing some of ours have been around since the 1920's. Very cool! I don't live anywhere that I could ever see these, so thanks for sharing them! I have never seen any either....but they are neat. Ours are the old standard black. Stay cool today! A first for me,really unique find. ooh! i want them as walking stones in my yard!! I love them, very unique and different! No, I have not seen those before. I agree with TexWisGirl in that they would look great in yards. Oh my! Those are quite wonderful! Wow, we have never seen anything like that! So interesting! I have never seen before. i've never seen decorative ones before, i like these! Search on "drainspotting" or "manhole covers" in Pinterest and you'll be blown away! Also, there is a book called Quilting with Manhole Covers, by Shirley MacGregor. But no, I've never seen a decorative cover, except in photos. How fun to find 'em in the sidewalk! hmmm ... did my post disappear ...? I've never seen anything like these, but I would love to have some! Those are so cool! I can see why you took photos of them! How cool! You are very observant! I'd probably walk on them again and again without ever noticing. Never. But this is cool! Those are very cool manhole covers. I like searching for Toynbee Tiles when I go to a city.